This part of the Shift2Rail Programme adopts a traveller-centred approach in order to allow a full seamless multimodal travel experience: customers will be able to easily plan and purchase door-to-door journeys, as well as being assisted before, during and after their journey. Improved information technology, management and exploitation, and cross-industry collaboration will help to provide passengers with smart and personalised services for journey information and ticket purchase, together with entertainment and communication services. 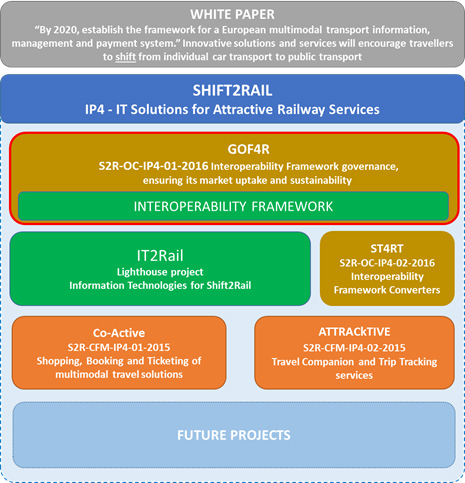 In order to enable such services, IP4 will develop an Interoperability Framework (IF), tools and technologies that will allow data exchange among different actors of the transport ecosystem, providing mechanisms to abstract data consumers from the complexity of varied data formats and non-integrated services, facilitating interoperability among new and existing systems.